I am making a postcard for every show Everybody Was In The French Resistance...Now played on our UK tour. This is my 4th Postcard. The first three are Here, Here and Here. They have all been sold. Bristol was the 4th day of our tour and the third with the Lovely Eggs. By now they were pretty much my favourite band. 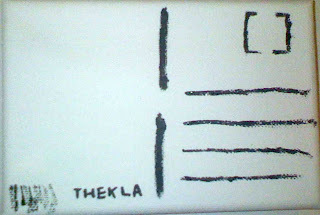 I'd been to the Thekla before a number of times. I'd never played it before though and I was really excited to finally be given the chance. Dyan had played here previously with her main band The Blood Arm. The night The Blood Arm played the Thekla their singer Nathaniel had made the crowd run from one side of the boat to the other making it violently rock from side to side. We found out when we played there that the manager who had been working in the office that night didn't know how to swim and as the boat started swaying feared for his life. Being shift manager of the Thekla is presumably the same as being the captain of the Thekla. So he would be expected to go down with his ship. Anyway, I was excited about finally getting to play the Thekla as I'm a big fan of Vivian Stanshall and he used to live on it. In 1982 the novelist Ki Longfellow-Stanshall who was married to Vivian had the idea of buying a huge boat and using it to stage poetry events, cabaret, musicals, live music and plays. The Thekla was found in the half abandoned docks in Sunderland and was perfect for the job. The Thekla had been a german boat used too carry timber and her hull was vast, clean, open and lined with a very hard wood. It was sailed down to Bristol harbour and renamed The Old Profanity Show Boat and although its name has since returned to the Thekla is still docked in the same place today. From the research I've done (mainly wikipedia) I've worked out Vivian, Ki and their daughter lived on the boat for, I think, three years. 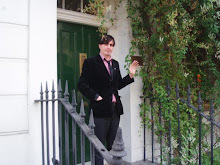 For an English Heritage blue plaque to commemorate the link between a location and a famous person. The famous person has to have been dead for twenty years. We're five years off of that for Vivian Stanshall. My postcard is of the plaque Im presuming will be going up in five years time. 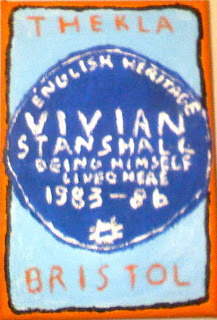 Vivian Stanshall is often described as a "great British eccentric" He didn't like this label though and insisted he was just being himself. This postcard is made of two 100% Cotton canvasses (6"x4"), a sharpie pen and some acrylic paint. If you buy it. I will fill the back in with what happened that day, add a stamp that I have also made and then stick it in an envelope with a real stamp and send it to you. you have played the kla before - art brut played there on the 5th May 2009! Damn. I genuinely couldn't remember if I had played it before. It must have been on a paticularly booz-y tour. Actually I just have a terrible memory.